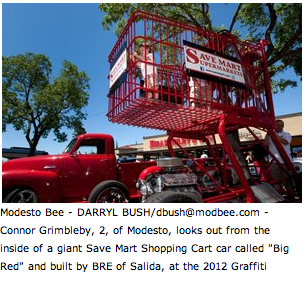 We went to a car show on Sunday and the photographer from the Modesto Bee took a bunch of pictures of Connor playing in a ginormous, drivable shopping cart. Though the picture didn't make it into the print edition, they did post it online and that's still cool in this mama's eyes. I showed Connor the picture and asked him who it was and he said "That's Connor...in shopping cart". Such an adorable kid! And such a little thing that only a mama would love! Bet he never lived that one down! His sister won't let him forget it!